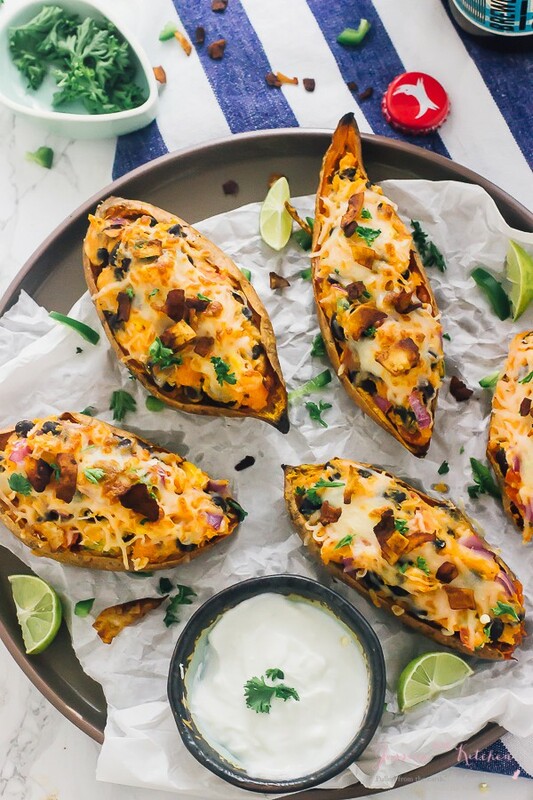 These Healthy Loaded Sweet Potato Skins are crispy, packed with 7.2g of protein, only 159 calories and still taste amazing! Guaranteed filling dinner or even party snack! 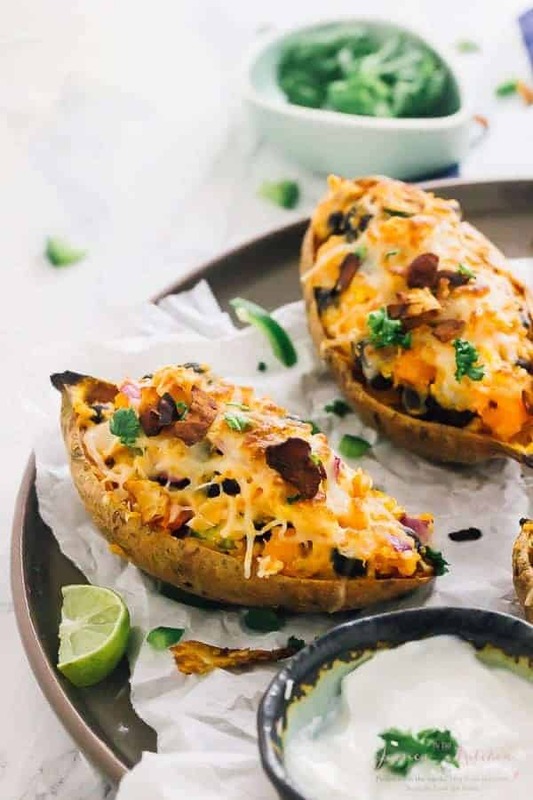 Friends, let me introduce the recipe that’s all my husband: these Healthy Loaded Sweet Potato Skins. This recipe is all him (I may have taken the pictures for them). Needless to say, since I’m sure these photos tell the story, these were insanely fantastic. Super loaded, healthy, filling, easy to make, and fun to eat. OH, you have to try the coconut bacon on top. I’m not the biggest American football fan, but boy do I have a lot of fans on my Facebook friend page. I knew the moment game season started because of this. When we were planning our recipes for this month, the Mr. and I thought that loaded sweet potatoes would be a great idea. He even said he wanted to try it by himself (can you say super kind trooper) and because I know he’s a super chef, I happily said yes. Imagine my surprise when he came back with an even better idea than mine: healthy loaded sweet potato skins. Uh, YES. These skins are so deliciously crispy it’s almost like you’re having Mexican sweet potato nachos. Wait, THAT sounds divine on its own *pens down*. Complete with the lime, jalapeño and black beans, these really are a great Mexican flavour theme game day snack. The crazy thing about it is that it could easily be a dinner. PRO TIP: the coconut bacon. It’s such an amazing topping on this and I now kind of understand what my bacon addict friends have been talking about. Salty and crunchy, it goes so well with the creamy sweet potato filling. We will definitely be making these loaded sweet potato skins again soon, and definitely for Super Bowl next year. P.S. Who are you rooting for this game season? So, I’m adding a new section to all my blog posts called “Your Questions Answered”! I’m always looking for new ways to help out my readers (see super in-depth recipe). You guys always ask so many questions so I put some answers here to help you out! Q: How do you make loaded sweet potato skins crispy? A: The key to crispy sweet potato skins is (1) ensuring you leave only enough sweet potato flesh inside the skins to keep them solid, and (2) twice baking them with the olive oil brushing. Don’t skip this step! 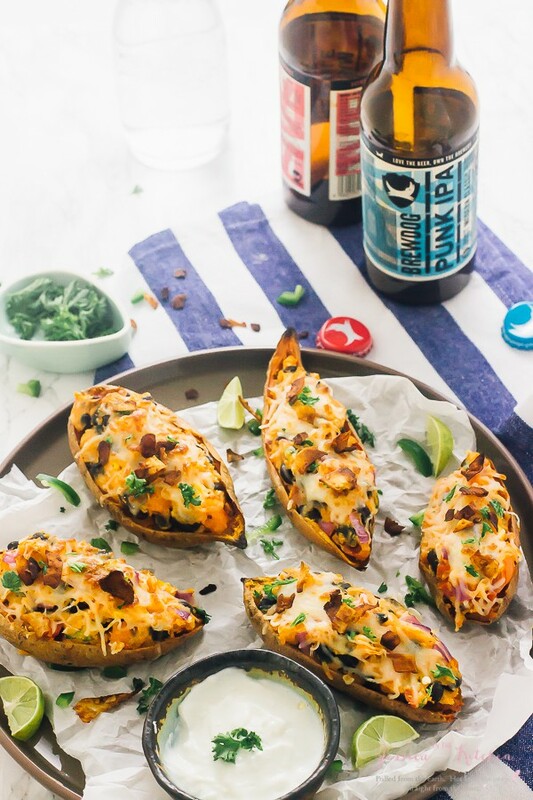 Q: Are loaded sweet potato skins gluten free? Q: Can I skip the cheese/switch up these ingredients? A: Definitely. If you want to make this vegan you can. Another great idea would be to load these with chili, guacamole and a fresh tomato salsa! If you try these Healthy Loaded Sweet Potato Skins please let me know in the comment section below, or tag me on instagram with the hashtag #jessicainthekitchen! For more exclusive recipes follow me on Instagram AND on Snapchat: jessinkitchen. Prick sweet potatoes with a fork and bake for 45-50 minutes, or until fork tender. Slice sweet potatoes in half and allow to cool slightly. While cooling, in a pan over medium heat, add 1 teaspoon of the olive oil and cook down onions, garlic, bell peppers and tomatoes until slightly tender, about 8 minutes. Scoop out the flesh out of the potatoes, leaving a thin layer of sweet potato inside. Add it to a bowl with the onions, garlic, bell peppers, diced tomatoes, black beans, greek yogurt, cheese, salt, pepper, paprika and jalapeño. Stir together and set aside. Rub the bottoms of the potato skins with the rest of the oil, place bottom up, and bake for another 5-10 minutes until crispy. Remove from oven and fill with the sweet potato mixture. Top evenly with the ¼ cup mozzarella cheese and bake for another 10 to 15 minutes until cheese is melted. Remove from oven and top with coconut bacon . 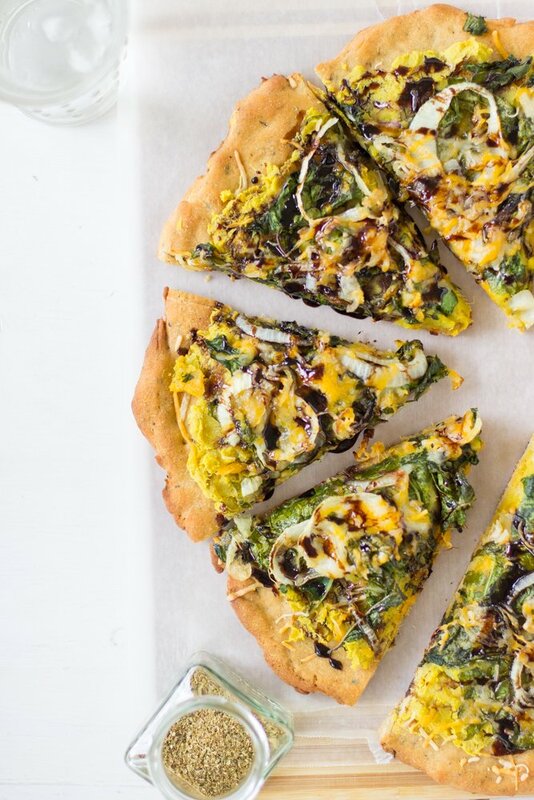 Serve with coconut or vegan greek yogurt. Enjoy! These skins can be stored in an airtight tupperware container for up to 4 days. Click the link to learn how to make coconut bacon . 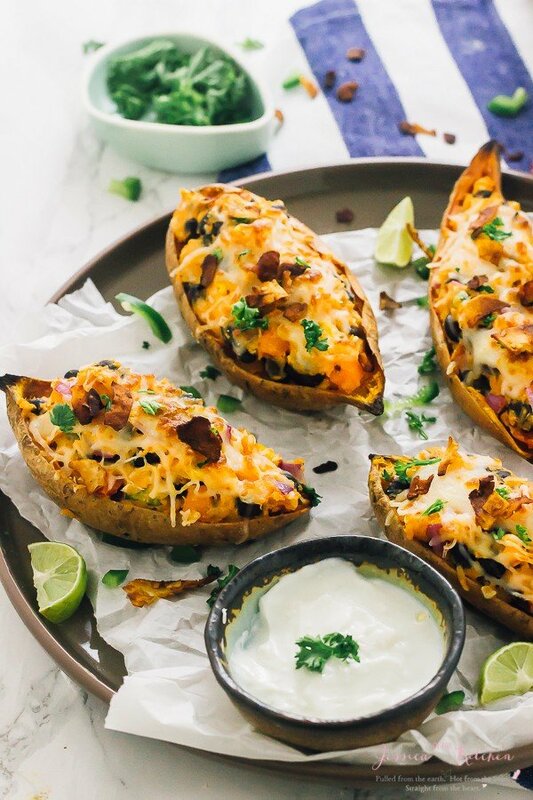 These sweet potato skins look so GOOD! Loaded with all the goodness, but not many calories..fantastic! These sweet potato skins look so delicious. Thanks for posting with us as well as ingredients also. Thanks Jenny you’re so welcome! This is really very delicious…. !